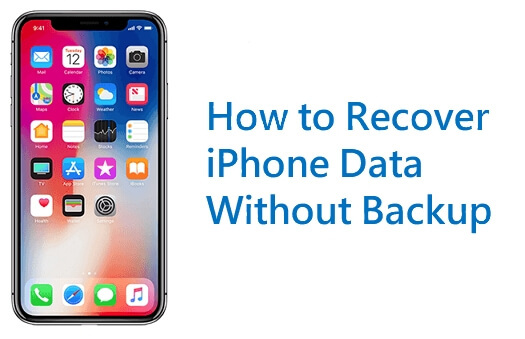 Yes, losing iPhone data without backup has been a familiar problem for iPhone users. Not many people back up their iPhone regularly. When an accident happened, they find out that there are NO backups available from which they can restore their iPhone. So here the problem is, what should we do when we lost iPhone data without any backup on iTunes and iCloud? First of all, let's figure out the problem that many users may have: is it possible to recover deleted iPhone files without backup. The truth is you have to resort to some third-party tools, otherwise the chance is slim to none. When you accidentally delete the files on iPhone, they are not deleted immediately; instead, they are just transferred from "Allocated" to "Unallocated" folder. Only when you create new files and occupy the "Unallocated" space, these files will vanish from your device. Therefore it's possible for the third-party tool to access iOS database and recover deleted data without any backups. In the following part, we will introduce a wonderful iOS data recovery tool and guide you how to use it. Recover up to 22+ file types include photos, contacts, messages, iMessages, videos, voice memo, calendar, notes and more. Supports to recover 3rd-party app data such as WhatsApp messages, Skype messages, WeChat messages, Kik messages. Adopt advanced technology to search and access the deleted data from SQLite database. Data deleted long time ago is possible to be recovered. High recovery rate and easy operations. Compatible with iPhone 4/5/6/6s/SE/7/8/X/XS/XR, iPad Pro/Mini, iPod Touch 4/5 and more iDevice running iOS 12/11/10/9. Highly rated by CNET, PCWorld, Engadget, Payette Forward and more in terms of iOS data recovery. 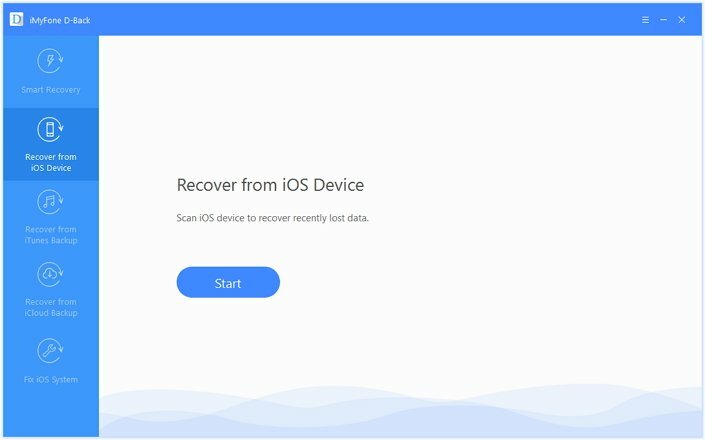 Open the iOS data recovery program after you install it on your computer, click "Start" from the Recover from iOS Device tab. And you will see the file types that the iOS data recovery software can recover. Select what you need. And then the iOS recovery tool will prompt you to connect your iOS device to the computer. Click "Scan" and the iOS data recovery tool will scan the file types according to your selection in the beginning. The precise scan will hugely decrease the time of hunting for lost data. And please kindly wait. After iMyfone D-Back finds your lost data, it will show them all on the interface. And you can click each item under each category to check the specific content and then select those you need to recover. Just click on "Recover" and create one folder on your computer to restore the found data. So, just three steps and a few minutes, you can find the lost iPhone data with iMyfone D-Back iOS data recovery! No worries any more when you lose your data in the future! If you need furthur gudiance, you may refer to the following video. If you can't find the lost data in "Recover from iOS Device" mode, please try to recover data from iTunes or iCloud backups. Please make sure that your iPhone connected with the computer during the recovery process. Q1: Can D-Back recover my lost data if my iPhone is dead/there is no backup file/I have factory reset the phone or else? It depends. D-Back is able to recover most of the data as long as they are not overwritten yet. To check if the data is overwritten, you can download the free trial and connect your device for scanning. If this program can find your lost data, it means you can recover using the purchased version. Q2: What data can be recovered by D-Back? D-Back can recover 22+ types of files, including your photos, (i)messages, notes, contacts, voice mails, WhatsApp, Call history and more. Q3: Can D-Back recover the data I deleted 1 year ago? Still, it depends on whether the data has been totally overwritten or whether you have made a backup at that time. 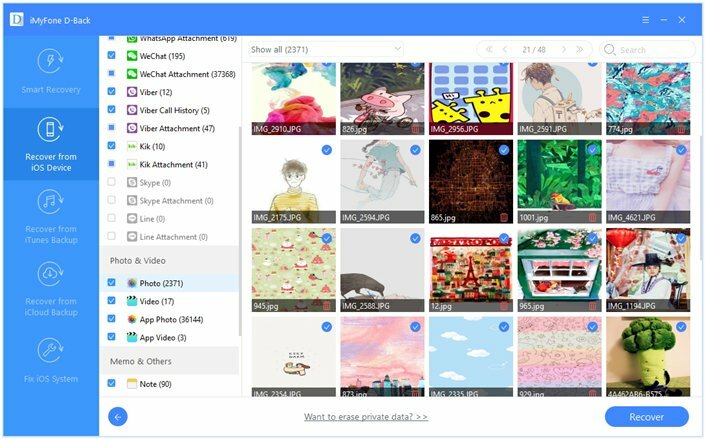 The free trial of D-Back can help you directly access and view all the files on your device; it also can extract data from iTunes/iCloud backup. If you can find the lost data using free trial, you can recover with full version. iMyFone D-Back will help you deal with any possible data loss risk like it has served for many other users. 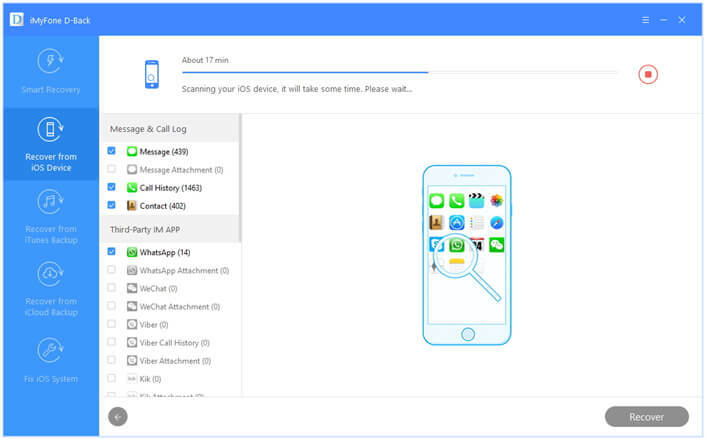 And now, the trial version of iMyFone D-Back (iPhone data recovery) (fully compatible with iOS 12) is offered for free trial and you should give it a shot. I met the same problem just like johnson. googled and found your tutorial. thx. it worked. i tried the smart recovery mode and got back my lost contacts and imessages. Thanks for your comment, Luizy! I never back up my phone. Bad habit, I know! How often are we supposed to back up things? Hello Susan, the answer is different for everyone. The more often your files change, the more often you need to back them up.